We may be bias at Shoreline Pools, but a backyard landscape cannot be complete without a swimming pool. 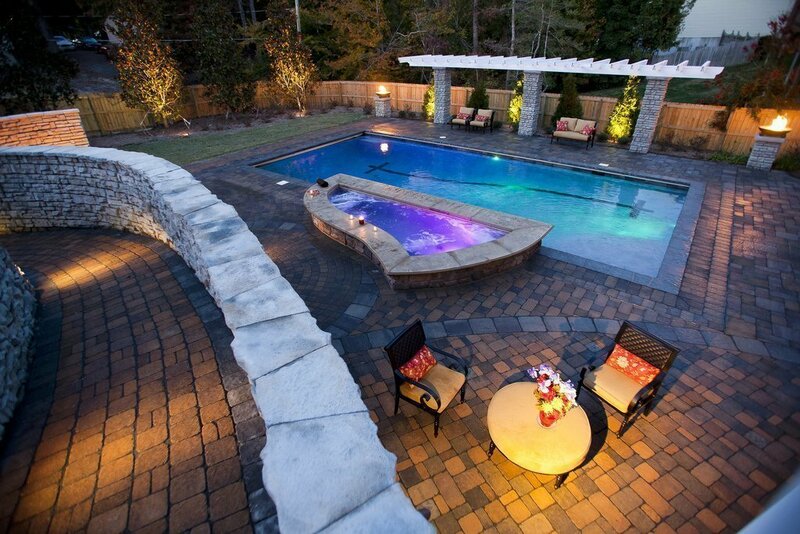 Conversely, a pool cannot be complete without complementing landscaping and lighting. If you’re still in the process of designing your dream pool, or a current owner looking to elevate your pool’s aesthetic, considering your lighting options is essential. After all, you’ll want to use your swimming pool at night, right? Whether practical, safety-focused lighting, or ambient lighting to enhance your pool’s overall mood, the right lighting can turn your basic backyard swimming hole into a resort-like oasis. Safety is the top concern of every pool owner (and pool professional!). Nobody wants to accidentally fall into the pool at night as the result of a poorly lit pool deck or poorly placed pool lights that create a dangerous obstacle course. If you have a concrete deck or are planning to install one, consider in-ground lights that eliminate the chances of a trip-and-slip into the drink. “When that ol’ moon gets-a big and bright, it’s a supernatural delight…” Okay, so you won’t necessarily be dancing by the moonlight, you’ll definitely be swimming by the moonlight. What’s better than a dip on a summer night?! While you can’t rely on the moon to light your pool, moonlighting gives the illusion of moonlight. Lights can be strategically mounted to trees or your home’s roof to create an ambient setting. You’ve spent thousands on beautiful plantings and trees—why not make them a focal point? Incorporating custom soft-lighting is the perfect way to highlight the landscape around your pool and create a resort-like feel. Consider using a combination of directional lighting (such as uplighting and spotlighting) along pathways, walls, pergolas and on trees and branches. Any water feature, whether it’s a waterfall, grotto or a shallow, beach-style entry, needs lighting (for practical purposes as well as for visual reasons). Adding lights underneath your waterfall can add a fun and classy effect at night, while ambient lights in a grotto can create a romantic setting. Ask our pool designers what your options are! Most people will agree—they love seeing the light, but not the source. That’s where undercap lighting comes in. These lighting fixtures are designed to cast light downwards and be hidden within your landscape and on various fixtures around your pool (think underneath a stone seating area or the lip of a wall). Similar to undercap lights, stair tread lights are meant to focus light downward. Installing stair lights is a smart way to enhance the safety of any pool area staircase without being too distracting. Need some more information about pool lighting? Contact one of our pool pros by email or phone.